Glenn Boer joined us this December and he just sent a great video of his trip to our island, combined with his trip extension to nearby Guatemala. 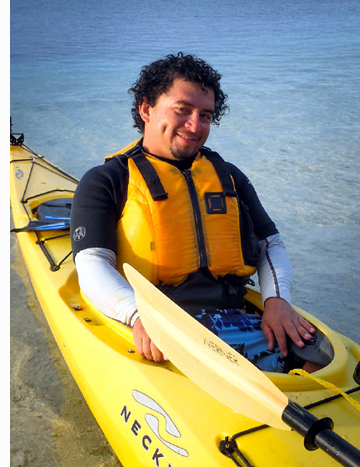 The first 3 minutes is about our island an includes the boat ride to the atoll, his cabana, paddling near the island, a kitesurfing lesson, and snorkeling with underwater footage! A fantastic montage! Thanks Glenn. Occasionally we get this question… people rightly figure that if they are going south, they want to stay south and see more than just one country. What a great combination! 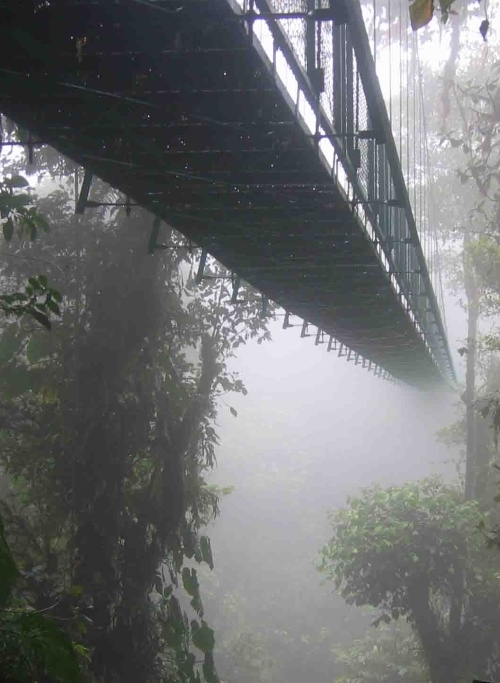 Belize for the coral reefs and Mayan ruins, and Costa Rica for the cloud forest. Three different airlines fly between the two, and on the quickest and cheapest schedules there is only one stop (San Salvador, El Salvador), so it’s very doable. They all share so you may actually be on one airline on the way over and a different one on the way back. The three airlines are Avianca, Taca, and Lasca. They can get you between the two in just over four hours and they go every day. You can also fly between the two in about five hours stopping in Panama instead of El Salvador, but it costs about $200 more. The cost between the two is currently $334 – $584 (depending on the day of the week) round trip. You will have to do a little research to figure out whether to fly from the US to Belize or to Costa Rica. On some dates it is roughly the same, on other dates we checked it was more expensive to fly in and out of Costa Rica. 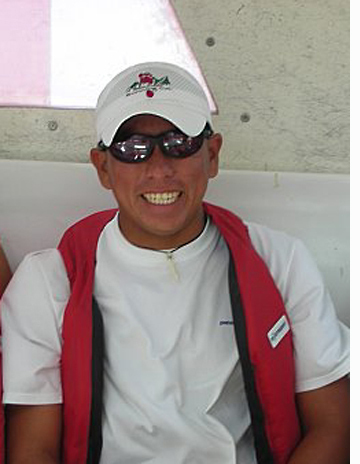 There is a great travel company in Costa Rica similar to us: Serendipity Adventures. They come highly recommended, and are the only other company I have found offering as many sports as we do. Why not spend a week in Belize on our island, then fly to Costa Rica and do one of their week-long trips? For example, consider their 7-day Costa Rica Intrepid Adventure Tour which is 7 days of horseback riding, hiking and climbing trees, rafting, rain forest, cloud forest, hiking a volcano, soaking in hot springs, and a zipline canopy tour. Wouldn’t this be a great honeymoon? Or why not a second honeymoon if you already took your first? A recent NY Times article hit close to home for those of us in the travel industry, and allows me an opportunity to get on my soapbox a little bit to inform our readers of some behind-the-scenes facts of the travel industry that you may not be aware of. In the article large websites like Expedia, Travelocity, and Orbitz have been exposed as a somewhat greedy business model that takes much or all of the profit a travel company makes. We do not list with these sites for this reason. 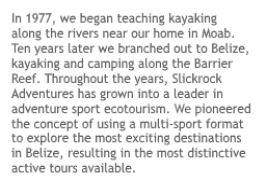 Our 40 year history in the adventure travel industry includes some unpleasant experiences with huge conglomerate travel sites like REI Adventures, The Sierra Club, and others. These companies rarely run their own trips, they are simply re-selling the hard work of others. They are so big that it is impossible for a small company to compete on the online marketplace. These booking agencies demand very high commissions, in the neighborhood of 20-30%, which is basically all or even more of the potential profit than one can expect to make in this industry. And when you are selling all inclusive packages like we do, they are not only making profit off of the rooms, like Expedia and Travelocity do, but also off of our sport gear, guiding services, meals, cold beer, everything. When you sign up with a company like one of these, be aware that the company taking you on your vacation will have no extra money to give you a kids discount, a group discount, or to take care of an emergency without going in the hole, like hiring another van if suddenly theirs develops issues. The booking agency has already sucked up all of the profit off of the top, and they don’t even have to run the trip! Years ago we chose to discontinue working with companies like this, so that we can give the discounts available to our guests. We reward our return guests on any date, and allow families to bring their children under 11 for a discount, even though those children take up just as much room as an adult does (and we have very limited group sizes). Groups of 4 or more also receive a discount, and sometimes we put specific Belize trips on sale that have no bookings 2 months out. If we were paying high commissions on top of these discounts, we wouldn’t be able to reward our customers in this way. I hope that everyone reading this post will consider doing your own research and signing up with the tour company or hotel directly, rather than booking through a huge conglomerate. By doing this you allow the company to spend the money they make on you, rather than giving it all to the booking agency, leaving the company with no funds to make any improvements in their accommodations, to pay their staff well, or to buy new equipment for their facility. I’ve been back from Slickrock’s island in Belize about a week now. I really wish I had more of a chance to interact with all of the staff, but the week flies by and before you know it you’re back at your desk staring at your screensaver. 😉 I can not possibly stress the incredible job the kitchen staff did each and every day, I’m in awe. I did want to pass on kudos and recognize a few of the guys I was lucky enough to spend a lot of time with. I can say that besides my great group of “strangers” I had just met, these men are the reason I extended my stay from half the week to the full time. I can’t even begin to tell you what a gem this man is, he’d magically pop up out of seemingly nowhere ready to help with anything, not one negative comment ever came out of his mouth and he always, always had a smile on. I knew he had a million things to do but if he saw me sitting alone he never hesitated to come over and engage me in something even if that meant he’d be working longer on his “to do” list. We had a great time one day when he got me up from sitting & “thinking too much” (how’d he know I was sitting there worried about home stuff?!!) to grab the pole and go coconut hunting for rice that night. He taught me the ins & outs of the perfect coconut, snagging it then somehow even made lugging 8 coconuts around behind him seem like a great time. He’s a hidden treasure and made my island time even more special. You can visit my blog to read more about our coconut quest that day. Luis has to be one of the most polite, funny and informative people I’ve ever met. We had a great time kidding around and “smack talking” about everything from his water skills to the rules of island dominoes. (These rules seem to change depending on who is winning…cough cough) The very first day I met him at the Biltmore he told me he would give me the best snorkels of my life, I laughed but he was right. I was constantly amazed at the immense knowledge he had for the sea and all of the life in it. I felt like I was constantly popping him up out of the water to ask some nerdy question about what I was seeing but he never showed an ounce of impatience. 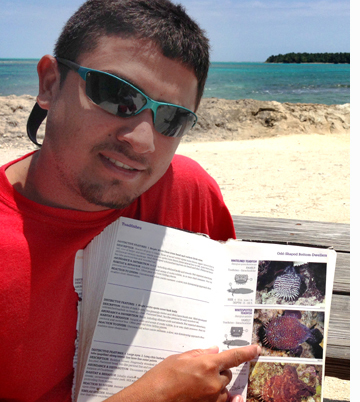 His love for the reef and the island has really inspired me to be more involved in conservation and education efforts. A constant laugh, a great attitude even when things didn’t go exactly as planned and a real concern for the safety of everyone with him really meant a lot not only to me but to the entire group. It was reassuring to have someone who was out having fun with us but would still enforce safety rules in a polite, firm manner. 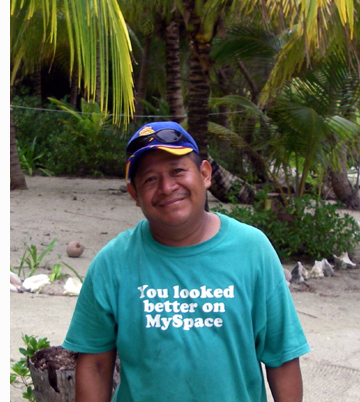 I admit it, I met Carlos and thought crazy island guy! Five minutes into our conversation I realized this was a man with a deep love for the island, the sea, the people and pretty much everyone around him. He had the unfortunate luck of getting stuck with me on our practice snorkel the first day, while I had remembered to pack some obscure items I did not think to check my equipment prior to the trip. Half way out things started going wrong, fins wouldn’t stay on, mask was completely messed up, hair issues – you name it. Instead of just taking me back to shore or having me deal with it he spent a ton of time working through each issue and by the time we had made it back (from what turned out to be an excellent snorkel) I was wearing his head wrap to block my hair, his mask so I could see and his snorkel too! He used mine till we got back and was able to fix everything, in the meantime he loaned me his extras. I have to admit the fin problem was operator error but I would have never known that if he hadn’t taken the time to get in the lagoon to observe my “technique” and correct the way I was swimming. He also took a lot of time and patience to work with the younger guests on our trip that seemed to flock to him and he did a great job managing situations. I showed up at the Biltmore as a solo traveler, I was worried about pretty much everything and I see a guy with a huge smile in a Slickrock shirt headed for me in the lobby. He introduced himself & said he was my guide, I said I was really sorry he was stuck with that job and he told me not to worry, he’d be my “buddy” to do activities with anytime I needed that week. He immediately took an anxious situation for me and turned it around. His orientation was great, he showed immense patience the entire trip and he’s so well educated with pretty much everything I was in awe. (and I probably asked waaay too many questions of him too) I think the best thing about Neri is that while he is fun, adventurous, smart and all that good stuff you want in a great time you ALWAYS knew safety was at the front of his mind. At no time during my stay was I worried about safety at all and that says a LOT for me. He faced a few situations during the week that questioned rules in order to have “more fun” and he handled them in such a way that everyone was kept happy and the rules were still followed. He is a true asset and was definitely the go-to guy when you needed anything, he really made this trip the best it could have been for me. 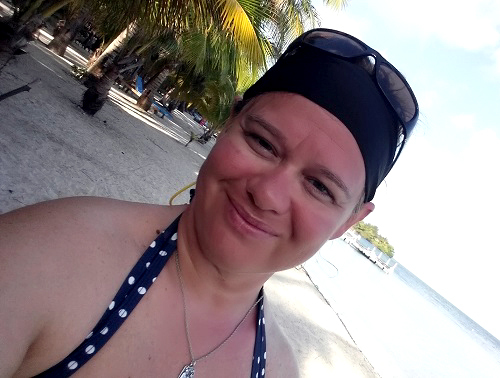 Maryann Izzarelli joined us in April of 2015 on our island in Belize. You can visit her personal blog to read more about her island adventures. We’ve already covered this subject somewhat in a previous post: “How to combine Belize Travel Itineraries” but we thought it might be useful to expand it a bit for travelers who might be heading in other directions before or after their adventure in Belize. 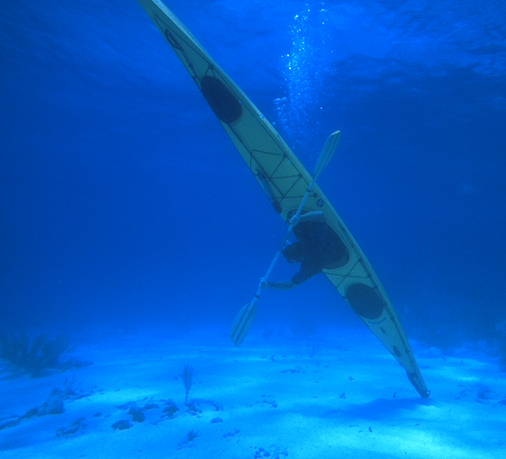 Our Belize travel season is in full swing; we are on our 5th week of a 24-week season. Christmas is the craziest time of year for international travel and this season is definitely no exception. 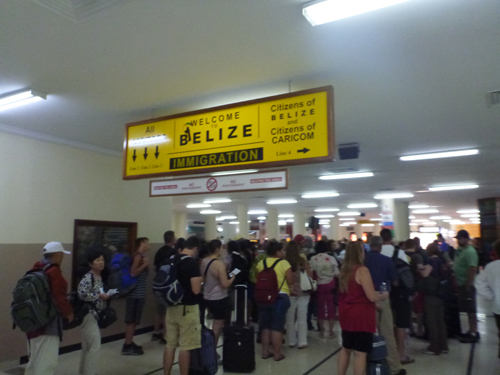 Already, with only 15% of our guests either in Belize or just returned home, we have experienced the following: a single traveler who arrived on the island 2 days late due to a cancelled flight, stranding her in San Salvador on the way to Belize (at a cost of about $900 extra to catch up with the trip! ), one cancelled boat to the island due to extreme weather in Belize that left one group on the island a day extra and one group in Belize City an additional day, luggage that was so late that it didn’t even arrive in time for our day-late boat, a family of four stuck in San Salvador (but they arrived on time since they were coming a day early), and another family scheduled to arrive in Belize 2 days early that barely made it on time to our meeting, 2 days later. Whew! We have blogged about this before, please visit this blog post and study up on why you too should protect yourself when you invest your hard-earned cash on a much-needed vacation! Why should you buy trip insurance? Caracol Mayan ruin is located south of the Belizean city of San Ignacio. 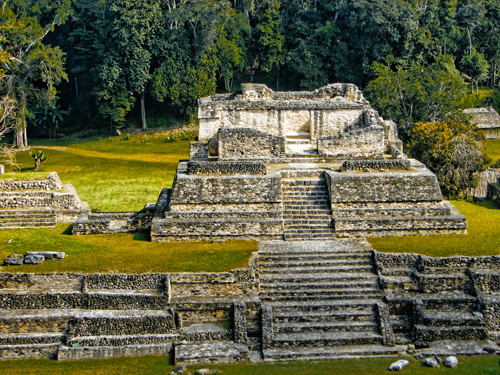 Caracol is the most magnificent Maya site in Belize, and in fact one of the largest in the Maya world. It is not as extensively restored as other sites because it was completely lost in the rainforest for over 1000 years until its discovery in 1937. The first archaeologist who studied Caracol soon after its discovery named it “Snail” (“Caracol” in Spanish) because of the large numbers of snail shells found there, but the original Mayan name translated to “Three Hill Water”, making this one of the few Maya sites where the true name is known. Habitation began approximately 600 BC and continued until 900 AD, or even as late as 1150 AD according to some sources. At its height, Caracol is thought to have been home to 150,000 people, with over 30,000 structures – a far greater density than at Tikal. It covered an area much larger than present day Belize City (the largest metropolitan area in the country of Belize) and supported more than twice the modern city’s population. Water to the ancient city was supplied by man-made reservoirs as they had no reliable river access. One of the reservoirs is used by on-site archaeologists & other personnel to this day. There are seven ancient causeways or roads leading to the site. The tallest structure in Belize – ancient or modern – is Caracol’s El Caana (“Sky Place”) at a height of 137 feet. Over 100 tombs have been found at Caracol. Yesterday we blogged about The Inn at Chaa Creek, our favorite lodge in western Belize. If you are staying in the Cayo region, you won’t want to miss a visit to Cahal Pech. It’s very easy to get to, it is just a 20-minute walk from downtown San Ignacio, and overlooks the town. This small Mayan complex has undergone extensive restoration. 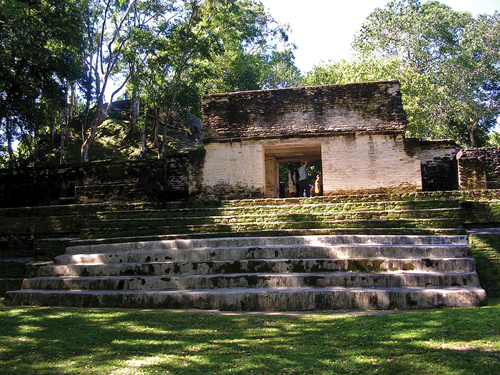 Cahal Pech was the royal acropolis-palace of an elite Mayan ruling family who lived here during the Classic period. It was settled around 1000 BC and abandoned by 800 AD. The site consists of seven plazas and over 30 structures including temples, residences, ballcourts, and an altar, all situated on just 2 acres. A royal burial chamber was found in one of the structures. Inside the tomb a ruler had been laid to rest with the accoutrements necessary for the afterlife. Included in the find were shell and bone ornaments, pottery vessels, obsidian blades, and jade objects, the most impressive being a jade and shell mosaic mask. One of the temples that you can climb in this small complex commands an unsurpassed view of the surrounding Belize River Valley. The visitor center and museum has a model of the site, excellent paintings showing Cahal Pech in its heyday, and an interpretive film. Because it is a small site, you don’t have to take a whole day, or even a whole half-day here. Just fit in a walk up to Cahal Pech when you have a couple of extra hours. You don’t need to pay for a tour, just go check it out (there is an entrance fee however). 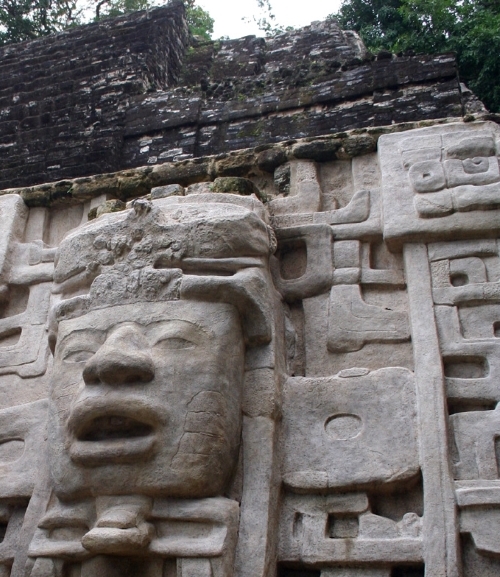 Hire a guide at the larger ruins like Xunantunich, Caracol, or Tikal in nearby Guatemala. To read about other Belize Mayan ruins, visit our website. 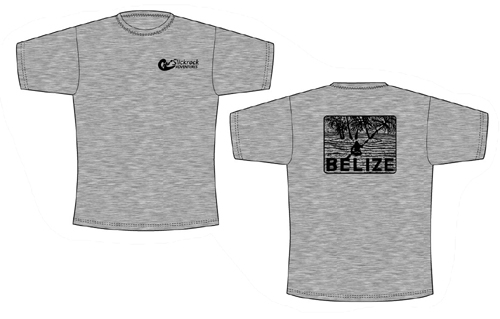 When you sign up for a Belize trip with us, it’s an all-inclusive package. There are no restaurants on the island, so the food is included. There is no bar on the island, so beer is included. We don’t want the hassle of selling individual guided activities or sport lessons, so all the sport gear and daily guided activities are part of the package. You also get a Slickrock t-shirt! I just redesigned the shirts; we are pleased with the results! 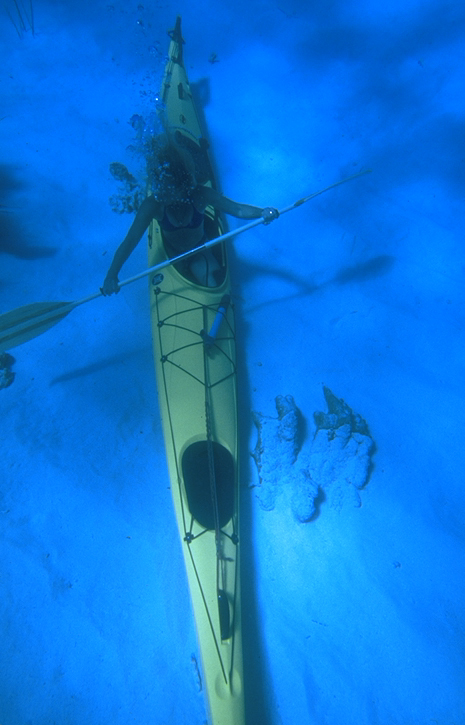 and the other is Bev attempting to paddle across the sea bed.